The man is Eric Calisto, and apparently he was inspired by the aforementioned episode of The Office. You can read about his progress at Kickstarter, and he wants about $25,000 of funding. At this writing, only four people have pledged about $28. 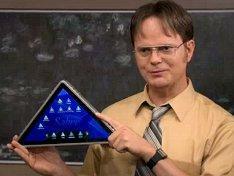 I noticed the picture on Kickstarter isn’t really of a triangular tablet, but only a triangle. Considering that Kickstarter is made for concept technology looking for funding, I’m surprised that there isn’t a better mock-up as proof of concept. Perhaps this guy needs to borrow some props from NBC. If you want to try can get on board with this possible new tablet fad, head over to Kickstarter and pledge now. The first individual who gives $5,000 will actually get to pick the name for the tablet. I’m not planning on sending an amount that large, but I do have a few suggestions for names: the Isosceles, the Equilateral, and the Scalene. Oh wait, those are just triangle types, and I can’t help but wonder type of triangle this tablet will be. Of course, I wonder if there is even a future for a triangular tablet, because I want to instinctively say “no”.